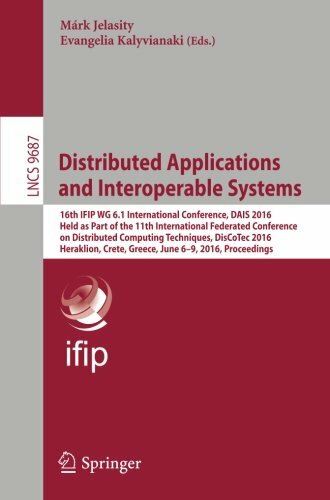 This book constitutes the proceedings of the 16th IFIP International Conference on Distributed Applications and Interoperable Systems, DAIS 2016, held in Heraklion, Crete, Greece, in June 2016. The 13 papers presented together with 3 short papers in this volume were carefully reviewed and selected from 34 submissions. They represent a compelling sample of the state-of-the-art in the area of distributed applications and interoperable systems. Cloud computing and services received a large emphasis this year. About: This book constitutes the proceedings of the 16th IFIP International Conference on Distributed Applications and Interoperable Systems, DAIS 2016, held in Heraklion, Crete, Greece, in June 2016.